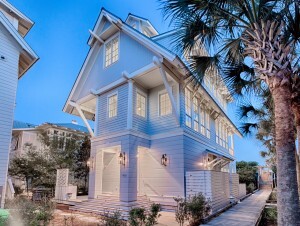 Adorned with custom furnishings, draperies, and cabinetry, this home was decorated in true coastal elegance. Throughout the main living space on the second floor are pops of color in varying shades of blue which compliment the views of the Gulf. Created with the ultimate view of the Gulf in mind, a 26 foot wide nano door was installed to allow the fresh gulf breeze flow into the living space. Located off the main living space, the kitchen features custom cabinetry, Calcutta marble, exquisite fixtures, and high-end appliances. White cabinets paired with the marble create a light and open space for preparing delicious family meals. Additionally, you’ll find a cozy breakfast nook with a stylish booth and stools as well as a spacious dining room off of the main living space perfect for large family gatherings. 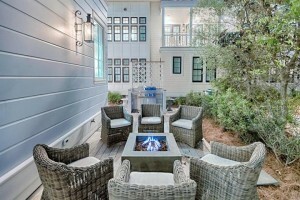 When it comes to outdoor living space, this home certainly isn’t lacking. On the first floor, a long deck features a fire pit with comfortable wicker chairs and a concrete, custom-made ping pong table. On the second floor off of the main living space, you’ll find an expansive covered porch with breathtaking Gulf views perfect for relaxing and enjoying the sunset or having family meals outside. Located on the first floor, you’ll find a living space with four built-in bunks, a small office space, as well as a bedroom with a loft. High ceilings and a soft color palette create a light, open living space perfect for curling up with a good book. In addition to its impressive living spaces, this home boasts three master suites with beautiful decor in a soothing, coastal color palette. Each master suite is appointed with a luxurious bathroom featuring marble counter tops, soaking tubs, large vanity spaces with dual sinks, and fine fixtures. 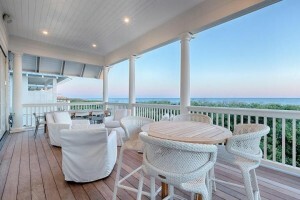 This home sits on over 1/3 an acre of land with 48 feet of gulf frontage and includes beach ownership. It also offers an under-home storage system for kayaks and YOLO boards and is only a 15-second walk from the private community pool in WaterColor. Get complete details on this home!